Every 6 months since year 2005 Greenpeace Russia conducts surveys at forestforum.ru to find out how professional forest community evaluates current condition of forestry in Russia. Each time we ask forestforum.ru-users specifically about the latest half-year time period, whether they think it was positive or negative for Russia’s forestry. The answers range from “(1) Very good – the positive trends were dominating and things got better” to “(5) Very bad – the negative trends were dominating and things got worse and sad”. Majority of forestforum.ru-users work with or closely related to forest and forestry issues. Thereby this survey allows us to estimate “index of forest optimism”, which rather well reflects the dominant opinion among forest professionals about current state of Russia’s forestry. Since 2005 the index of forest optimism was always negative (generally corresponding to “worse than average” and “very bad”). Until 2007 (the first year of new Forest Code enforcement) inclusively the index was rapidly dropping. Since 2009 and until 2014 it was gradually growing and at the end of 2014 reached the level as prior to new Forest Code. In 2015 the index dropped again. 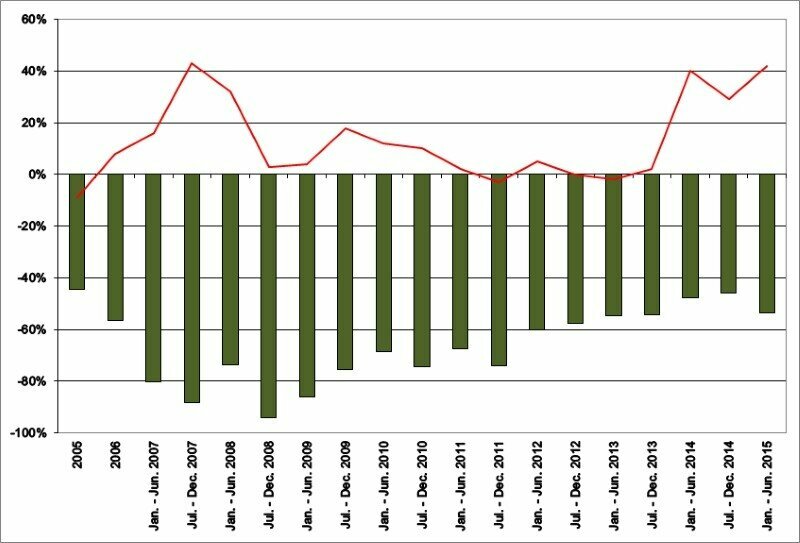 Dynamics of index of forest optimism from January 2005 to June 2015 (green bars). For comparison we add data on “assessment of situation in the country” from Levada-Center (red line on the graph, data source: http://www.levada.ru/eng/indexes-0).